Topic Flea Market from the General Chit-Chat forum. Good news. That's Sunday, Sept 23, in Shubert Alley. so this was today...did anyone meet her???? i wish i could of... but anyways, i know some other people on a different forum who said they spent like all day in her line and it was a long one..which is good. and they said she doesnt look a day over 40! no really? haha so hopefully some people from here can tell stories!! heyy! i got to go and yes i did meet her very briefly. i also got to meet two fellow members of this board which was so much fun. we almost didnt get to meet her but we pushed our way to the front and ended up having to pay 40 dollars! lol but anything for bernadette! 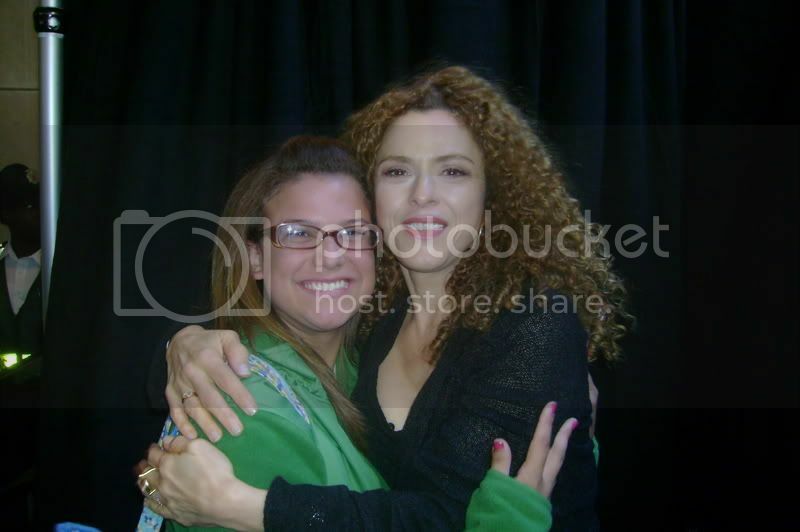 I have two pics with her ill post them in the photos portion of this site! I met her. The line was insanity so many people screaming for her to go into the photo booth. They put her in very late. Her time was supposed to be 3-3:50 and I think she went in about 3:45 but they finally put her in and let lines of ten wait for her at a time. She looked great and was very gracious as always. edit: and that picture is sooooo cute!! she looks freaking amazing! it was soo much fun. Congratulations to everyone who got to go! That is a really great picture. "I chose and my world was shaken, so what? The choice may have been mistaken...the choosing was not..."
Today was amazing! Bernadette looked beautiful as always and it was fun meeting fellow message boarders. When the guy cut it off at ten people and I was the tenth and suppose to be final person to get in for a pic I freaked out because I had been standing there for two hours waiting for them to bring her over to the booth. I think Bernadette said it was okay for more people to get a pic with her cause there were a lot of people that still went after me. I wish I could post my pic to share but I won't be able to scan it until later in the week cause I am in my dorm room with no way of putting the polaroid on the computer. I am still freaking out that she hugged me and my roommate thinks I'm nuts but it is by far my fav pic of me and Bernadette. The flea market as a whole was great and I got a lot of Tony Award merchandise, Gypsy postcards that were autographed for a dollar! and sticker with bernadette's name on it for a dollar lol plus JoAnne Worley threw some plastic pearls on me and acted all crazy and it was only 5 bucks for that plus an autograph pic of her was attached. I got some great pics of the Redgraves as well accidentally bumping into Christine Ebersole. Overall, great day. "If you'll just hold Chowsie for me-that's short for chow mein. Mommy just loves her chow mein, now doesn't she, Chowsie Wowsie?" "Once I was a schlepper...Now I'm Miss Mezepa"
It sounds like you had a really great time and I have to say I LOVED reading your post...it cracked me up. I especially loved the "...for a dollar!" parts... and the JoAnne Worley went crazy for "...only 5 bucks..." It could just be my lack of sleep, but this had me laughing out loud to the crazed looks of my family. Oh well, it's Bernadette so totally worth being looked at like you've grown a second head, right!?! Congrats again to everyone who got to go. oh man, you got a lot of stuff. well reading that gets me all excited even though i wasnt there cause knowing that she is so great to her fans gives me hope to meet her at the sd in march. save all that stuff. OMG is it gonna be worth some money in the future. im glad everyone had an amazing time!! luckies!! Great pics, everyone, thanks for sharing. What a sweet lady, hugging you all ... that's really very sweet. All of the pics are wonderful. You guys had a fun day!